The game opens with Bayonetta on a shopping expedition, the conniving Enzo her mule. Yet it quickly devolves into a battle in the skies, atop an improbably large jet with fearsome looking centaurs. Bayonetta can be easily regarded, by those who may not have experienced the games themselves, as a symbol of the objectification of women, a prime example of pandering to a perceived audience. But I feel that this could not be further from the truth; she is the apex predator, whether she is performing a brutal ‘Torture Attack’ on a heavily armed centaur, or verbally putting a mouthy child-god in their place, Bayonetta is always in control. If you see her being knock from her feet, or impaired in some way, it is probably just a prelude to an even more intense fight – which she will surely win. When the battle is over, she clears the way to the next area by blowing a kiss of magical hearts, or shooting a heart shaped salvo of bullets – she is just too classy. That is pretty much the arc of Bayonetta 2, increasingly insurmountable odds being surmounted, usually with a flurry of hair-demons and the shooting of pistols that are totally strapped to her heels. It is a whole lot of style. I’m not entirely sure what happened throughout most of the narrative, this may partly because I never experienced the entire story of the original Bayonetta. Or the more likely reason is that Bayonetta 2 is so insane, and so many of the crazy things that happen are taken as normal, it is hard to rationalize anything that is happening here. I just let it wash over me. There are other characters, which are all very distinct but they can’t compete with Bayonetta for style or personality; there is the foul mouthed Enzo, and the extremely irritating Loki (I don’t think even he knows what accent he has). Yet my favourite was Luka, a photo journalist with a widely inflated ego and an unhealthy obsession with Bayonetta, which sees him swinging and crashing into some key events. For all his suave demeanour he is kind of a joke. There are plenty of other, competent characters, which are, if nothing else hard to forget. Bayonetta’s combo-based fighting system is quite traditional in design, with moves centred around whichever weapon is equipped in her hands, or on her feet. You can choose two sets of weapons , allowing you to switch between them mid-battle. On the first Climax, and perhaps the second Climax (easy and normal difficulties, respectively), trying out the weapons different is fun, but not essential. On the higher difficulties, there are simply weapons sets that will be more effective than others against certain enemy types, and you’ll want any advantage you can get. 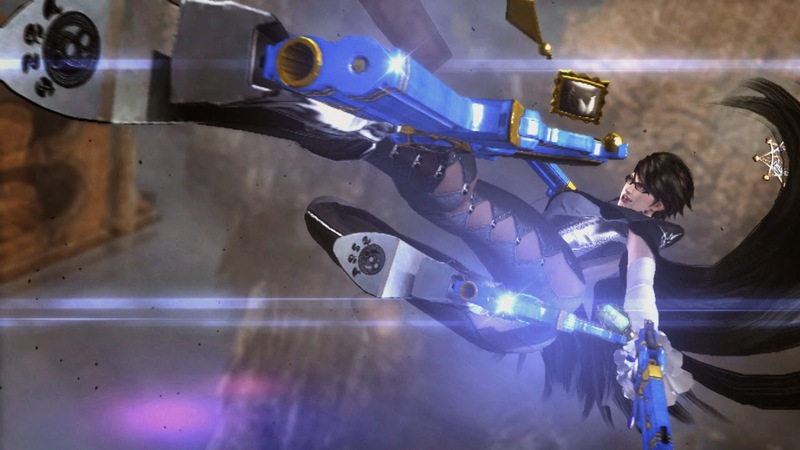 New moves and weapons can be purchased from Rodin’s shady bar using halos as currency, which naturally help to reinvigorate Bayonetta’s arsenal, and the combat. I never felt the combat becoming tiresome, the fights are too fast and the enemies are constantly changing. If you do lose the will to hammer out combos the game does support touch controls, where all you have to do is tap on the enemy you want to hit, and watch it play out. I quickly found myself taking to using blades and whips, Bayonetta would launch enemies in to the air – or conversely wrench them down – using her heel-whips, before closing in with a pink flurry of blades. 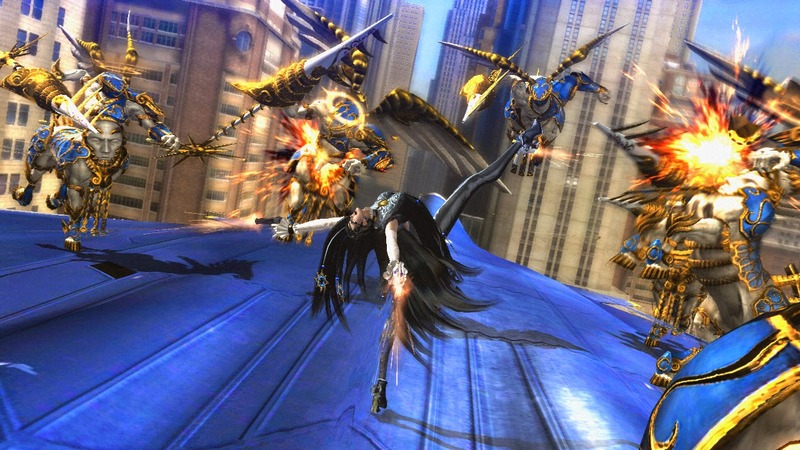 Bayonetta and the other humanoid characters you fight alongside, or against, all have well animated moves, and suitably over the top effects. Especially Umbran Climaxes, these can be trigger in virtual every fight, often multiple times; Bayonetta summons her hair-demons in their various forms to inflict massive damage on which ever enemy is unfortunate enough to have survived this long. The most obscene moves are reserved for boss fights and Torture Attacks. Torture attacks are finishing moves performed on regular enemies; Bayonetta summons a rather malicious killing device, perhaps a guillotine, or a giant wheel covered in spikes and basically kicks the targeted enemy into it. It is awesome. Boss fights – which occur almost as regularly as normal enemy encounters – elevate the spectacle to a new level entirely. Naturally, most boss fights are at an extreme scale, seeing Bayonetta best gigantic demonic manta rays and towering headless knights of light. These fights for the most part are decided by how fast you can recognise and dodge the enemy’s attacks. Successfully dodging doesn’t just keep you alive, it triggers Witch Time, a slow motion states that often pulls Bayonetta in close to the enemy for attacks that it may have otherwise dodged, then it’s on to beating the creature senseless. Once the boss’s often many health bars have been depleted it’s on to triggering the finisher. These are unique to each boss; Bayonetta break into a kind of dance, stripping of her hair-clothes and summoning great hair-demons in their place. The summons and their battles are some of the most visually stunning scenes in the game; in some fights Bayonetta will summon them into the background to fight one enemy while she engages another, all of which takes place on a scale only really seen in the God of War games. The finishers performed on bosses are often times ridiculous, in one quite early in the game, Bayonetta summons several pairs of huge hands which roll up the creature and briefly play volleyball, before batting it off into the distance. Whether Bayonetta is fighting a church-throwing dragon in the centre of a whirlpool, or riding a demonic horse along an ever twisting spine in the maw of hell, it is always a visually treat. The environmental art, and the monsters are quite unique in their design. However, part of my appreciation of the environments is very much the manner in which you traverse them, often Bayonetta will launch between objects, fighting on any surface. The creatures Bayonetta faces a herald from both the inferno and the heavens, light and dark, honestly I found the white porcelain faces of the angelic creatures far more unsettling than anything Hell could through Bayonetta’s way. 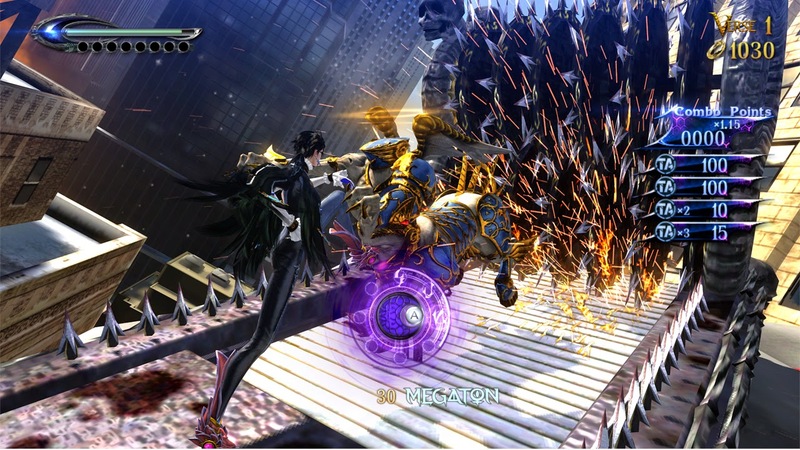 You don’t have to see these sights and specimens of Bayonetta 2 alone, in Tag Climax you fight alongside another player. It is a kind of challenge mode, with players wagering halos and competing against one another to see who can beat up enemies with the most style. Between that, the four Climaxes (all story stages are ranked), the challenge rooms, and countless treats to unlock, Bayonetta 2 is ripe for replay. Bayonetta 2 is an excellent action game, the fast paced combat is combo heavy, with a lot of weapon combinations and enemies to master, it certainly requires your utmost attention if you want to hit those platinum ranks. But Bayonetta 2’s true strength comes from Bayonetta herself; her walk, talk and acrobatic moves all exude more style than all of the supporting characters combined. Whether she is summoning a demonic avatar from her unfurling hair, to smash an incoming meteor, or parrying the golden blades of the Lumen Sage with her heels, Bayonetta always comes out on top. Bayonetta 2 is one of the finest action games I’ve played, Wii U owners would be doing themselves a disservice if they didn’t at least check out the demo.